The final day, Day 3. This is the day when the more tired want a direct route back, or maybe even one that skirts around the edges of the hills. They don’t so much care whether it’s still off-road or not as long as the climbs aren’t too technical. 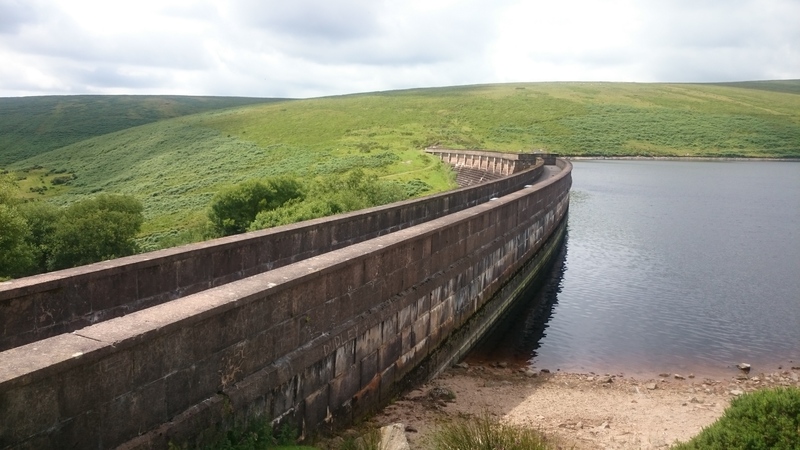 On the other hand, those with energy to spare and miles remaining in the legs quite fancy finishing off in style and not allowing the trek to fizzle out at the end. I won’t say who was in which category, you can make your own guesses! Straight up the hill past the mill out of Ivybridge and right onto Two Moors Way. Then came a déjà vu moment, “we should ride down this, not up” I could hear me telling myself. Obviously a routing mistake that I’d made last year and again this year too. Ah well, maybe another time. But for now it was just a technical climb, trying not to spin out on the rocks. The point where the route became new and untested was up at Spurrell’s Cross where we headed downhill on a grassy descent. I was glad we weren’t having to climb up at that point, because it was steep and long and boy did we fly down there, finally coming to stop by a babbling brook. 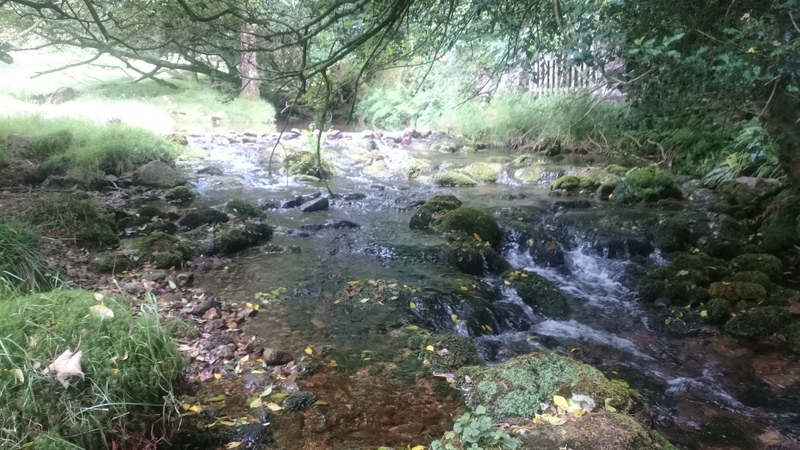 I filled up my spare water bottle from this brook and the water was crystal clear and tasted lovely and fresh too. I took the risk and didn’t bother with purifying tablets. From here we rode through the stream to cross to a gate, with a range of wetness of foot, and then climbed up to a field at the top, along a farm track and to a road. It’s a strange experience to feel like you’re in the middle of nowhere high up in the hills with no sign of other people, only to moments later pass a farm house and pop out onto a road. But you’re never really that far from civilisation on a trip like this, even though at times you may feel like you are! This brought us to Owley and then we followed the roads to Shipley Bridge. 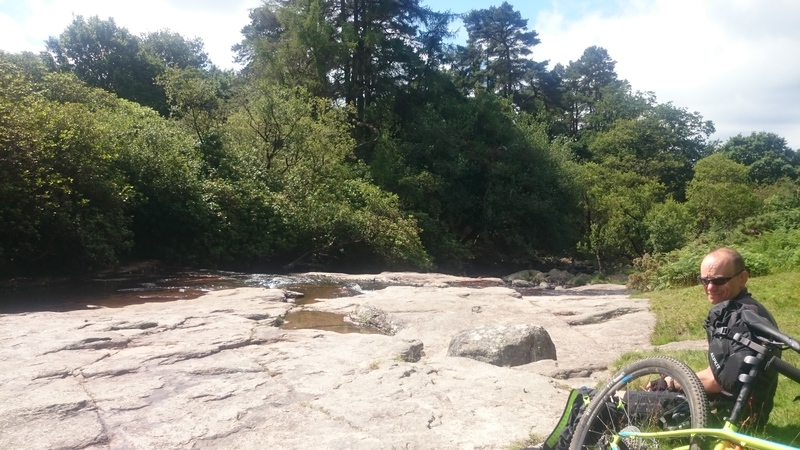 From here, there is a path that follows the River Avon as it carves it’s path between Shipley Torr and Black Torr and when the sun is shinning on a hot summer’s day it’s a fantastic ride. Sure it’s not mountain biking, it’s a paved surface of good quality but that doesn’t make the scenery any less impressive. So we found a spot along here for lunch, in the sun. The path takes you up to the foot of a dam, but a little bit before this you can branch off to the right and follow a track that climbs up beside the reservoir at the top, this then joins Abbot’s Way which is a grassy bridleway strewn with tricky rocks and took us around Grippers Hill and back down to the road near Bowden. The third day of this trek was definitely the day for getting your feet wet. Not like last year when it was due to rain from the sky and spray from our wheels either. This time Day 3 saw us getting our feet wet by crossing streams and paddling in rivers. The bottom of Abbot’s Way brought another stream crossing, although the option of taking the bridge instead was there this time for Malcolm, who after paddling in the Avon a little earlier decided to stay on the dry this time around! Phil and I took the ford option. From there, with a long way left and some tired legs and to be honest not too many other options we took the road through a variety of villages and down to the river dart. The scenery making up for the lack of bridleway and adventure. 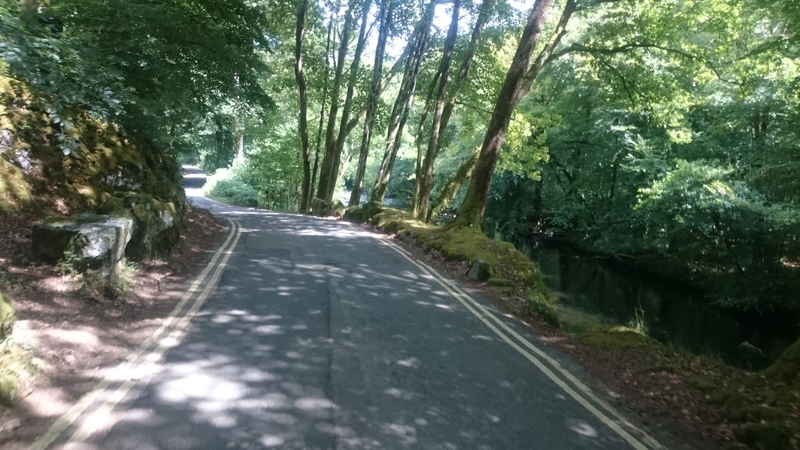 Road may offer a better and more easily ridable surface but that doesn’t guarantee a lack of hills and Dartmoor certainly has it’s tough ones. 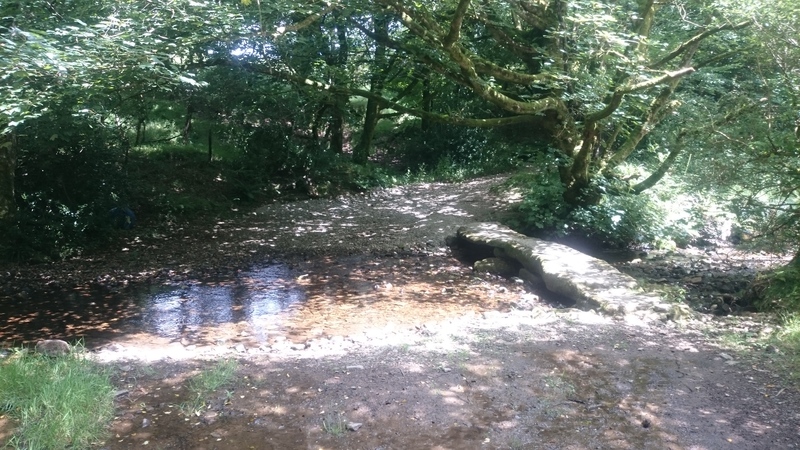 The climb up from the River Dart to Buckland in the Moor is a prime example; hitting us with the task of gaining around 130 m of elevation in just over 1 km distance, an unrelenting climb only offset by the shade of the forest trees and the waiting bench at the top providing somewhere to sit while waiting for the others to catch up. Not too steep to get a photo on the move! From there we carried on climbing upwards on a road named Elliot’s Hill which eventually became a gravelly and sometimes rocky track and took us from 235 m elevation up to 341 m at Pudsham Down. A little further up the road we would reach our high point of the day; although maybe more elevation than elation though! From here it was then mostly downhill; not all the way of course, this is Dartmoor after all, not the Fens of Cambridgeshire! 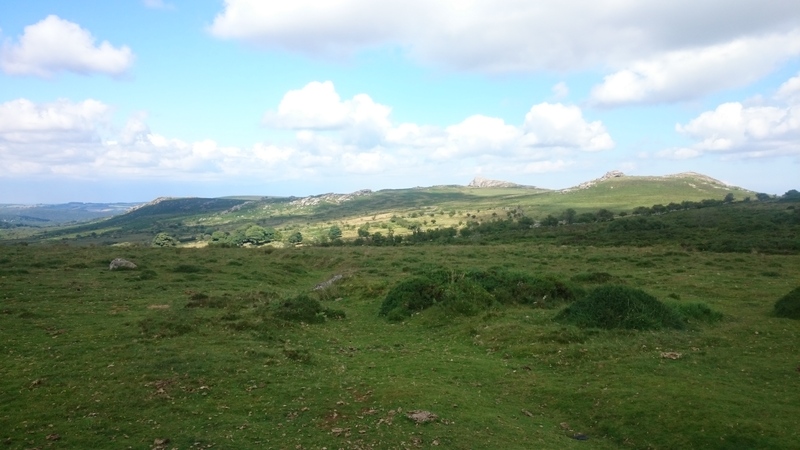 But first of all there was a long road descent that took us from Haytor Vale and almost down into Bovey Tracey. Truly ‘almost’ in fact; as we overshot a left turning onto a bridleway and had to retrace our pedal strokes for a few yards up the road. 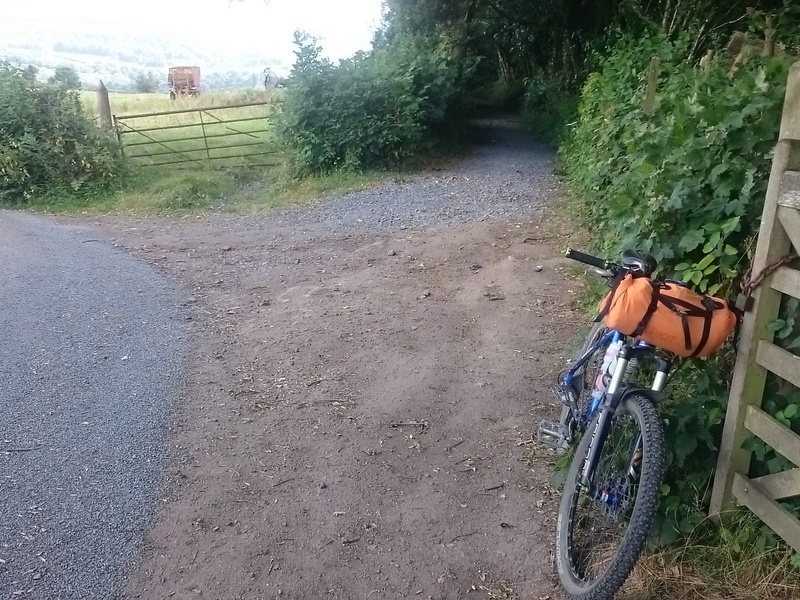 This bridleway was one of those rocky narrow descents that features plenty of trail side thorns and nettles; fortunately not enough to halt our progress or take the fun out of mountain biking, but sufficient for us to reach the bottom and the next section of road with plenty of battle scars. From here it was now clear to everyone that we were practically back to where we’d started on Day 1. The road signs giving away our location and the repeat riding of a byway reminding us of how much fun it had been on the way down but now leg sapping on the way back up. When I reached the top and looked back it did cross my mind that maybe I’d finally broken the other two! Fortunately I only had to wait a moment or two and the others were able to join me. So after a quick rest we set off again for the final road miles that would return us back to Christow and the waiting car. I say ‘road miles’ but if you tried to follow Bennah Hill on a road bike you’d be a little disappointed by the surface and you’d be slowly picking your way down, on the brakes all the way. Clearly this was once a road but has since been left to deteriorate and is now returning back to a track like surface. Ideal for mountain bikes like ours though! Unfortunately our final loose descent was scuppered by a 4×4 which there was no room to overtake and which was unable to go quick enough for us to have much fun. In retrospect we should have stopped after catching it and given in a few minutes to complete it’s descent and then hammered down there ourselves. And so with weary legs we arrived back to where we’d started off 3 days earlier. Great fun had by all, an experience to remember, even for Malcolm and me who had already done a similar 3 days last year. Phil even commented that he’d be up for doing it again next year; which I take as a glowing endorsement of the 3 day mtb trekking concept. So next year it is then. Another 3 summer days somewhere in the UK with minimal camping kit and of course Mountain Bikes!